i am also one of those hoping for a volca mix. But at a first glace, i am seriously underwhelmed, disappointed almost. Seems like the departure of Tatsuya Takahashi was a serious blow to the volca range. - why another set of cheesy speaker? The volca already have speaker. If I want to use those, I don't need the mixer. Also you can have battery powered speaker in almost any price range. - The power distribution does nothing what a splitter cable cannot also do. It is a waste of space. - why only 3 channels? There would have been sufficient space for 4-5 channels. - volcas already have a sync option. A buffered mult to distribute the sync would have been sufficient. On the plus side, there is the master section, but that is about it, as far as I can see. love this! if its a reasonable price ill definitely pick one up. . a bit like the koma mixer but more performance friendly. indeed. But almost comically expensive for what it is: $250 plus $30 shipping to europe plus european VAT (20%) means the thing costs $340 or so. You get a lot quite decent mixer for this kind of money, they might not have the volca form factor but are otherwise superior in every aspect. Once again, the Dude abides. 5 channels, battery powered, extremely portable. Even comes as a DIY kit. I agree it's ugly and for everthing it gives it seems to miss something else. Send is good, but no pan. By the way the aux in bypasses the master fx - but hey, master FX! I can see that if you are using speakers then having them all into one stereo set makes sense, but they will be mostly redundant. No MIDI or Sync in? Really Korg? That means this has to start everything. So a BSP or Keystep will have to be slaved to this. Still tempted by the size though. The Volca Mix does have a stereo aux send and return. Big swing and miss from Korg on this one, I wouldn't even use that if it was given for free. No pan (wtf!)? There's almost no actual features that I can see that add any value to your rig. then we'd be talking. As we can see from the Vixen if you want to do it right $150 MSRP is just cuts too many corners. I had higher hopes for this given all of the feedback Volca users have given to Korg whilst waiting for this. In a field that now has to compete with the KVR, Dude and the Field Kit series this just doesn’t seem to really hold it’s own. Conceptually I like the master section but, seems like they could have done more with the space available. I stand corrected on the aux send thing on the Volca Mix. I'd still go for the KVGear if I ever got serious about putting together an all-Volca rig, but we all value different things, differently. It's not quite the mixer I was expecting (I agree about the speakers, they seem like a very limited use case). I did see on CDM that the price was $169, so I think it's not bad for the price/features. The biggest turn off is definitely the number of inputs. The speakers just seem to shout 'I'm a toy!' to me too - the 'actual' volcas are decent cheap synths, but this mixer just looks like a plaything. "The volca mix is equipped with master effects powered by all-analog circuitry. 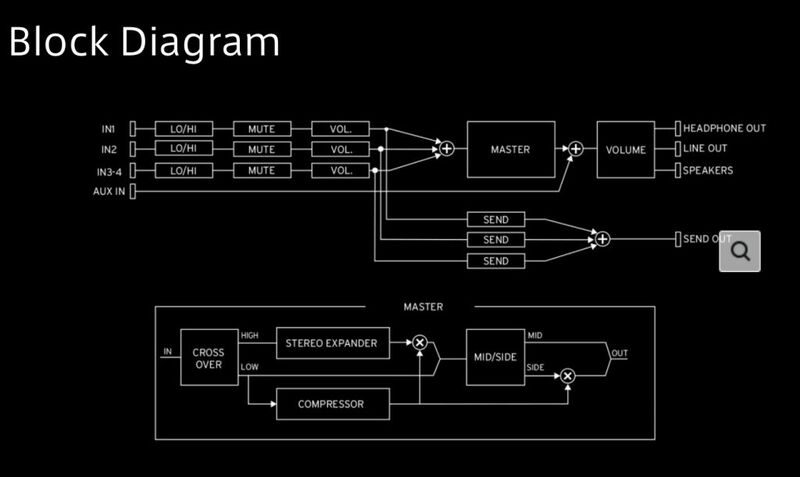 In addition to an expander that broadens a mono source into a stereo sound image, there’s a dynamic range compressor that compresses the high-frequency range according to level changes of the low-frequency region, as well as a side chain effect that’s indispensable for dance music. Use these to dynamically vary the mix, adding a professional feel to live performances with the volca." That's kind of intersting, though. That almost seems to be its usp. It can be a good bit of kit if you can feed kt modular-level signals okay: you would have a convenient tool to mix multiple oscillator waveforms and send them to filter or somewhere. For this given purpose three faders and EQ per channel in a small footprint can be very handy, and would open up for some tonal variety you won't probably be able to get with a vanilla DC mixer. Patching something like tELHARMONIC H, N, & P OUT onto it can be a lot of fun I imagine. Other than that, not at all breathtaking announcement, but I'd still be interested to test my OKGO & beats (two primary drum machines a.t.m) paired with it & see if built-in compressor and EQ are of much use – as is, I usually have to boost like 20dB on beats channel to get its kick & lt cut through. Not much of a problem, if I'm honest, but to be sure – sample is easier to mix due to its analogue isolator [master EQ] section, so clearly: in conjuction with volca mix beats would probably sound closer to one's expectations when looking for thick “produced”-like beats, I would think. Add to that a pair of $2K tube compressors at the end of a chain, and you can use it in a track even! Jokes aside, I get it master fx are analog (comp including), so not at all bad for $169. This thread pushed me out of a lurking stint. Since it has an auxin too, you could chain 2 together for 6 (plus another aux). I’m curious about the sidechain, wonder if it’ll behave right without a dedicated input. Otherwise if you use the Volca Kick for kicking, you could run a split signal into a compressor w/a sidechain input like FMR RNC. Not a fan of aesthetics and not may cool tricks like all the Volcas. The releases from Korg kinda show that the company without Tats is like Apple w/o Steve Jobs, just further expansion of older ideas. Iv'e been trying really hard to like this but it just isn't happening. No battery power means I can't use it for "picnic" sessions and the "Mute" not "PFL" is the final deal breaker, so there is no way of auditioning one volca before bringing it into the mix, wtf! Tuts please come back! Edit: How does it do sync out without a sync in? it has an internal clock generator that acts as a master clock. Now, if it also had a midi out (for clock) and the clock is solid, this would be something. But alas, just the sync pulses are not of much use since each volca can already do the same. Biggest for me is no cue function. I want to join in on hating this thing, but I am still intrigued. Especially the Master FX section. I am pretty sure my days of playing undergrounds and sketchy house parties are behind me, but with the price tag of a volca, I'd be reaching for this first as a cheap, but functional mixer. You clearly can see that this Volca mix isn’t designed by him. Very underwhelmed. Not enough channels, weird layout with wasted space, master clock seems superfluous, silly built-in speakers. I see this being a flop, maybe Korg will take another crack at it and a V2 will be better.